Liz Earle Eye Bright | £13.25 // I had a bottle of this in last months empties but somehow I had two bottles open and half empty so I used this second up pretty quickly. It's my favourite eye make-up remover and doesn't irritate my sensitive eyes like others do. I've just bought three more bottles as it means I don't have to pay postage and they'll keep me going for a while. 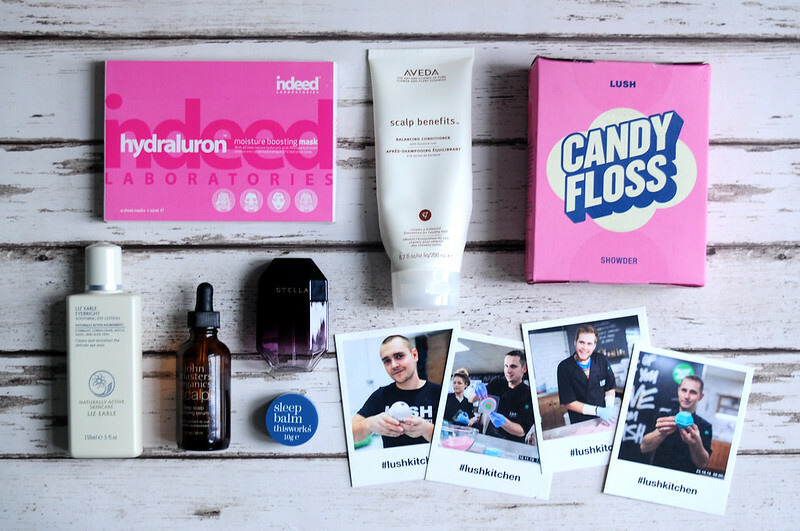 Indeed Labs Hydraluron Moisture Boosting Mask | £19.99 // I'm a huge fan of Hydraluron so I knew I just had to try the sheet mask version although it did take me a while to actually buy it. I like these come in a box of individually wrapped masks as it means they'll last longer and you are easily able to take one mask away on holiday. It's not the cheapest at nearly £20 for only four masks, but I did manage to buy them when they were on offer. I really loved how moisturising these were and I'd definitely buy them again. I'm currently trying to finish the Aveda Intensive Hydrating Masque which gives very similar results, but I will repurchase these sheet masks at some point. Lush Ylang Song Bath Bomb // I loved the neroli, rosewood and ylang ylang scent but I wasn't a fan of the flower petals that floated in the water after the bath bomb had dissolved. I don't think I'd buy this again if it came back into the kitchen. Lush Yog Bog Bath Bomb | £3.95 // I have to say I was quite disappointed in this bath bomb. I absolutely love the smoky caramel scent but the water turns a not so nice yellow colour. It's extremely moisturising but wasn't that great to sit and watch it fizz away in the bath. I have two more to use but I won't be stocking up in the boxing day sale which I had planned to do. Lush Dragons Egg Bath Bomb | £.50 // This is from the permanent collection and is an old favourite. It has a nice lemon scent with a hint of jasmine and there's also popping candy which makes it fun to watch and listen to it in the bath. Lush Granny Takes A Dip Bath Bomb // This was discontinued last summer as it took too long to make but was brought back to the kitchen for a few days and I bought one so I could use the bubble bar and bath bomb together. The pepper, ginger and lemon scent was really refreshing but I think I prefer the bubble bar. Lush Christmas Angel Bath Bomb // This has the same scent as Haagenbath Bath Bomb which is mint chocolate and it smells good enough to eat! Lush Magic Bath Bomb // I loved the look of this one and it was great to watch it fizz away before trying to find the coriander leaf floating somewhere in the water. Lush Lord Of Misrule Bath Bomb // I always buy this bath bomb when it's released for Halloween and I wish it was available all year round! Lush Blackberry Bath Bomb | £3.35 // I was disappointed to see that this bath bomb sunk to the bottom of the bath and wasn't really much fun to watch. I haven't had a Blackberry Bath Bomb for a while but I can't remember it happening before and it's definitely not because it's old as I haven't had it for a while. Lush Think Pink Bath Bomb | £2.65 // I feel like the scent of this bath bomb sums up Lush completely and I've lost count of how many I've bought over the years. It isn't one that I immediately think of buying when I go into Lush but it is one I always come back to. It's vanilla scented with hints of lavender and neroli. Lush Cinders Bath Bomb | £2.95 // I love these smaller bath bombs as they're perfect for my smaller than average bath and it means I don't have to go to the hassle of cutting them in half like I do with some of the others. I used this in a bath cocktail along with Sparkly Pumpkin Bubble Bar and Celebrate Body Lotion and all three went really well together. I love the orange and cinnamon scent and the popping candy makes it really fun. Lush Candy Floss Showder | £12.50 // I really like the idea of this new product from Lush, but the packaging just does not work. First of all it's cardboard so what's going to happen when your in the bath, you've got wet hands and you need to pour it so you can use it. Also the powder inside is going to get clumpy if it gets damp as it's not completely sealed. When I went to pour it into may hands too much came out at once so I ended up wasting quite a lot. In the end I decided to decant it into another empty container which made it a lot easier to use. Onto the actual product, it smells amazing and reminds me of Snow Fairy. The powder gently exfoliates the skin and if you mix it with a little bit of water it creates a sort of shower cream. I enjoyed using it, but it is quite expensive and now I've tried it I probably wouldn't buy it again. This Works Sleep Balm | £12 // I love this lavender scented balm and it really does help me sleep. I quite often use it as a hand balm and that way I get all the benefits which helps to keep my eczema at bay while also still being able to smell it while I go to sleep. Aveda Scalp Benefits Balancing Conditioner | £21 // This conditioner was ok but I wouldn't buy it again. There are others that are more moisturising and I didn't think it made a difference to my scalp. Stella Mccartney Stella Perfume | £44 // So many people rave about this perfume so I had to try it and while I liked it, I didn't love it and wouldn't buy it again.